They need to agree on how to pronounce Emiko. I think the director really dropped the ball with that. It was as bad as "Nanda Parbat," and that at least had a reason. Her name is in the title of the episode for heaven's sake! I didn't even recognize adult Zoe in the first future scene. Did we get a name for the other assistant guy who was blithely claiming to have taken care of Felicity Smoak at the end? Because I will look forward to Oliver murdering the hell out of that one, even though my money is totally on Felicity faking her death. I want more focus on Oliver and development for Felicity, but I had to laugh at Oliver's outrage that his father could have POSSIBLY kept a kid a secret from his family... I know the situation with William was fairly different, since he apparently knew about Emiko from birth on, but it is still tinged with hypocrisy and lack of self-awareness. The fic writer in me does find the possibilities for a flashback story of young Emiko sneaking into Club Verdant and spying on her half-sibs vaguely titillating. Will someone let me know when they find John Diggle? The first season of Fringe was a bit procedural for me, but so much of it is foundational to the rest. It’s very impressive storytelling. Of course, I didn’t go too deep into Fringe fandom because there was less to pick at, ha! I’d love to see that happen, but it would mean strange things for the present time line. It could be interesting to see. Black Canary vs. Green Arrow for a whole season, but I’m crushed that she’s still there and no one has said boo about where Oliver is in this future timeline. I understand them wanting to “do something different” and Oliver not eliminating the Big Bad Threat each season is that. I think they just rolled the dice on the totally wrong villian. With their five year arc, having Chase survive doesn’t give the finality they wanted (though, long lens of time, it would have been a much better call to help bridge the show into a new flashback-free state). In my opinion, the time was ripe for home-grown evil. They probably should have gone with Black Siren. I’m not a huge fan of Katie’s, but the role does suit her acting. The ideal would have been Thea going evil. Season six could have built to her reveal and then... obviously Oliver couldn’t just kill her or even turn her in at the end. Hell, I could even see him going to jail as a result of sacrificing himself for her. Then season seven is coming to terms and ultimately resolving Thea in some way so that Willa could leave the show and Thea would have a very, very good reason not to come back, but still find some peace of mind for Oliver. I still don’t know all the details about why Willa left the show, but that would be one meaty arc that I think she could have played the hell out of. Does the whole “Mark of Four” tattoo really sound like Oliver’s brain child to anyone? On the one hand, Oliver has struggled for a long time about learning to rely on people and be part of a team. The amount that he can and does now is possitive character growth. So... maybe? Maybe he rallies “heroes” with this tattoo crew? However, even though Oliver has three tattoos when he returns from Lian Yu, we ultimately learn that ALL three were forced upon him under various degrees of duress, and, given the chance, he has actually started to remove them. Would he really pick a tattoo as his Hero Crew team calling card? So, I hadn't thought about this until now, but why were they holding all the crazy weapons and neurotoxins in the asylum anyway? Those aren't personal effects; they are WEAPONS. These things should be in police lockup as evidence or destroyed. It's not like they are going to give them back to people when/if they are discharged, right? I know, I know, Crazy Gotham Comicbook Logic. But still. My head canon says that Oliver doesn't remember sleeping with her because he actually didn't, and she's still mad because he resisted her advances. I still need to see more of Maya, since I've never watched Shadowhunters, but I'm at least open to the idea of the show continuing with her as a female Green Arrow (as long as they give Olicity a good send off and/or potential for cameos). What's an occult fracture? Was he wrestling witches? I will never understand Diaz. I mean, I just don't see how he's supposedly so badass, but we never really saw any super strength from him, except for his pummeling of Oliver, which I honestly didn't buy after Oliver being so wonderfully awesome for the whole rest of the episode. And the turn in the fight, when Oliver gets the upper hand... aside for the touching nature of Felicity and William as a driving force, I really don't see how or why the tables turned so quickly. Their fight is such pure PLOT; it hurts my head so much. Yeah, I wondered about that, too, but now I'm assuming that this is all part of his GRAND PLAN (he likes those; just like Cayden James) to get himself believably arrested, so that he can get into Slabside, so that he can use his wickedly supper strong smashy punches to kill Oliver Queen with his bare hands, and then escape via whatever root his plant, Stanley, has cooked up for him. Of course, Oliver will wipe the floor with him because Oliver can punch walls without drugs, thanks. Don't do drugs, kids. I hope that the above is not the case, but fear that it may be so. I liked this episode better than last week. Very nice to finally, finally see Diaz taken down. Glad Felicity got to face off against him. I would have liked a little more give from that scene. I know Diaz still has to bravado it, but some indication that he believed her for even a moment would have been great. It was ugly to hear Dinah and Curtis complaining about losing credit to the Green Arrow "again." Even with all their stupidness last season, I didn't think they were mad that Oliver didn't share the credit. I thought they wanted to be a more equal part of the team (which was still stupid to me, but I could kind of understand it). This just makes them seem so small and horrible. So someone on my Tumblr feed just posted a gif series of the nightstick beat down that Oliver gets for staying behind and guarding Talia's escape, and I just have to laugh because the sticks are obviously hitting each other at first and Stephen doesn't flinch at the right time and even the overhead doesn't look like they are really connecting with Oliver. I didn't linger on it during the show because it was cut quickly and I wanted to see where the whole Level Two storyline played out, but I have to say, bad fight choreography. Maybe not quite as bad as the occasional punch that obviously never lands, but also not Arrow's best moment, you know? Maybe they do have a barber who just HATES Oliver. He shaves him bald and refuses to touch his facial hair. Something like this: RIP Stan Lee. How much would I have loved one of the ARGUS background players to turn around and give a WHAA-face to Curtis's sharing of "the picture that ARGUS didn't want us to have"? I liked "the only way out is through the morgue... no really, that's the way out, you can totally swim away through there" joke. So, for the characters I actually care about, how much advancement did this episode bring? - Oliver is essentially back to where he was two or three episodes ago because the Demon didn't know anything... except that she kind of had to know SOMETHING since Diaz did coordinate his attack with the shower attack on Oliver, so Talia totally did think that Oliver's wife would be killed and didn't care, AND she had some way to get information from Diaz even though level two had no visitors, so how they heck did that work? 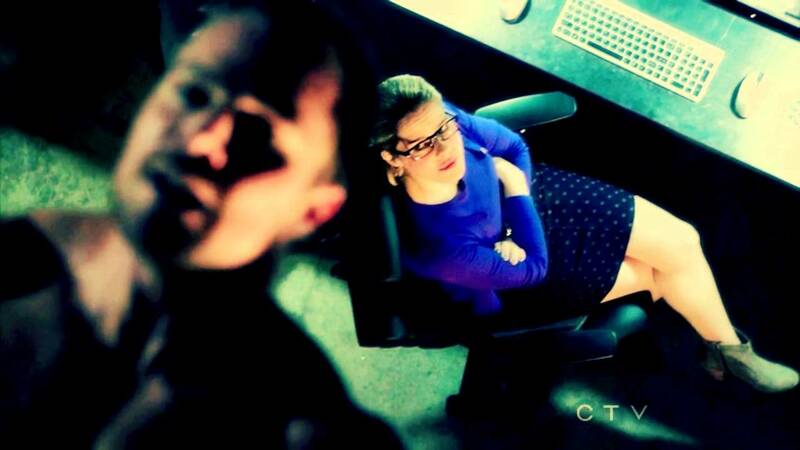 But for Oliver, he's back in his cell with a vague message about Felicity closing in on Diaz. - Felicity is, I guess, technically closer to two of her goals: 1) They somehow have evidence against the prison that might get Oliver out in Arrowverse court? So says the not-lawyer? and 2) They have a working tracker on Silencer, a few feet from Diaz (and apparently she has street-level tracking and maps of Moscow?). I guess these are both good, but #1 seems so weak on a rational level, especially since I got the impression that seeing Talia kill the doctor right after that scene was supposed to make me think that they can't get stuff to stick without the doctor to admit to his wrong doing, and #2 ... I honestly don't understand why they haven't taken down Diaz aaaages ago, so this doesn't feel like real progress because it is more just confirmation that Diaz is still alive? Exactly! He was under COVER... in the van. This episode... it was honestly pretty blah. I don't have any major complaints, but there wasn't anything I loved in it. The CDC check point was a joke! The guard glances at one (admittedly valid) FBI badge and then waves in four people? I'm surprised that DDDiaz and crew had to hack anything. And then the next scene has Felicity remarking to Samanda how much security the CDC has (although I assume she was talking about the computer)... although is it really that good if the bad guys hacked it? Because Lyla and Diggle really have played out this same argument before, it would have been nice to have them uncover the hinky stuff at ARGUS together. Also, why would Lyla try to piggyback the download and slow the mission when she could have spoofed the hard drive on the ride back to the hotel? They could still have Curtis detect the copy later and tell Diggle if they really wanted to play it that way.